One of the biggest sporting events of 2014 is the World Cup in Brazil, which will attract an audience of millions of fans from all over the globe. 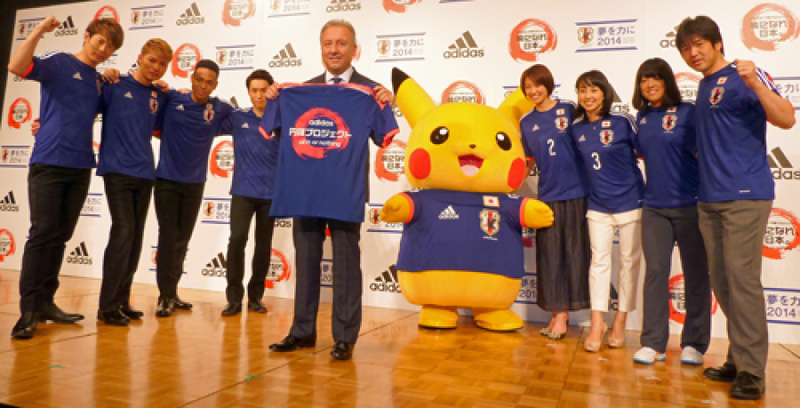 That of course means ample opportunities for advertising, and Adidas — which makes the kit of the Japanese national soccer team — has announced that it is teaming up with Pikachu and friends for a special promotion. So far all we've seen is a couple of promotional images showing various Pokémon in the famous blue shirt of Japan's side, but there's no telling how far this relationship will go — it would be wise to expect branded clothing and other merchandise, but it remains to be seen if this partnership will result in any kind of video game tie-in. Are you looking forward to the World Cup this year? Which team will you be rooting for? Let us know with a comment below. Yeah, they could make another Mario Strikers, but a more tactical game, without the exaggerating Mario stuff would be nice, since we don't have fifa anymore.. Yes! I would totally buy some shoes if there were pokemon on them. Haha!! I love it! Squirtle in a Japanese World Cup jersey is so damn cute! xD Love watching the world cup too! @JtotheY more tactical? Did you ever play the second game? Ubisoft once promoted their brand new IP Rayman Raving Rabbids during the 2006 World Cup to celebrate France's victory over Brazil in the quarter finals since Ubisoft of course has their headquarters located in France. Naturally I support my German Gunners, but I actually drew Germany in this tournament! Does the Wii U have ANY soccer game? We own both Strikers and Charged, The only other time I rrcall seeing a soccer ball is the heading section in Wii Fit U. Maybe they can add it into a new Mario Sports Mix. I do like the Pokemon marketing for team Japan, better than just a straight up sneaker ad. The World Cup is a pretty big stage. @rjejr There's FIFA 13, for what it's worth. Anyway, great little campaign. Japan got a very forgiving group stage, too, which means they could advance at least to the Round of 16. @JtotheY Megaman Soccer 2 confirmed! @AdanVC Why would you want that? All sports games are made boring Nintendo mascots liven it all up and are always well-designed. @JtotheY you mean I've been playing soccer wrong my whole life?! 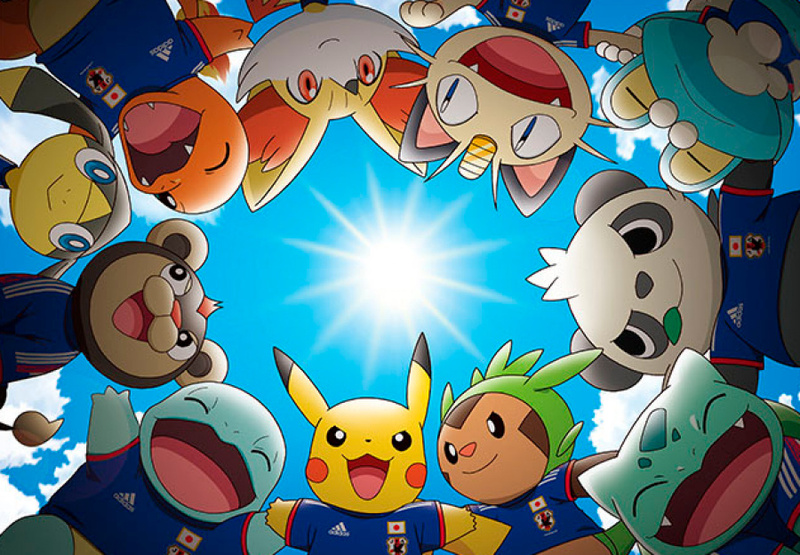 Imagine an Inazuma Eleven type soccer game, with all Pokemon as eligible players! Anyway, this is pretty awesome. Can't wait for June! They look like a good team, but can they beat the Legendaries or Team Rocket teams? If anyone remembers those old sports games like nfl blitz, or the nhl one, basically they were versions of sports game that kind of had no rules and were taken to the extreme. You could do things like cross check someone in hockey through the glass, and the goalie would occasionally transform into a brick wall covering the entire net. Anyway I say all that because all I can think of is pokemon soccer. "Oh no venusaur has the ball, charizard flamethrower." "It's a penalty kick, quick rydon use earthquake." Allakhazam, the psychic goalie. "Swampert turned the field into a swamp." That would just be too funny. I LIVE IN BRAZIL BUT I PREFER JAPAN !!!!!!!!! @JtotheY Japan is the only part of the world with any taste at all when it comes to Football games. (Only place that pro evolution soccer 2013 on the 3DS outsold the rubbish version of Fifa that has been rereleased three times). Pikachu looks well up for it in the group picture he looks kinda scary! @JonathanX you and me both! When this merchandise comes out, I will wear it with pride. Huh... I might actually watch football this year if the team has Pokemon on their shirts. All the Pokemon look so cute in their jerseys! Well, I guess Super Training is a Football-based minigame, so this makes sense. Confirmed! Pikachu is Japan's mascot for the World Cup.